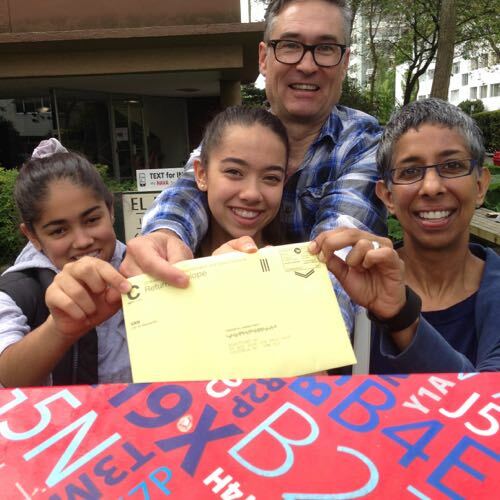 I know why I am voting “yes” in the transit referendum: To have a healthier and happier future for my family. I am convinced that by increasing our regional transit capacity there will be more opportunity for us to live active lives and create a positive environment for everyone in the Metro Van region to thrive. Of course we can list the numerous rational reasons about the importance of more transit, more bike lanes and less congestion from an economic and public health perspective, but the many stories of our lives will be what influences our decision. What are the stories that will motivate people to the importance of voting “yes” in the referendum? The stories that motivate me to vote “yes” are the prospects of a future where my family can live in a more ecologically sustainable, affordable and economically vital region. My wife does not drive and travels by walking, transit and bike. I know that improvements to this “active transportation” network will make her safer, happier and healthier. Our family made the decision not to own a car. We use Modo the Car Co-op and Car2Go when we need a car and we use active transportation the other times. As we all grow older it will be good to know that public transit will be able to support us. By creating excellent conditions to walk, ride and take transit we are proactively promoting lifestyles that will result in better health outcomes. My two daughters have been transit users from an early age. I have trekked with them back and forth from the West End to Kits to their school for many years. Now I am proud of their independence in their ability to navigate the city as adolescents. I know that better transportation infrastructure is going to make them more independent and improve their lives. Vancouver is a wonderful place to live. More and more people will be coming here. It is of vital importance to have a transportation system that can support all of us. A adequately funded public transportation system will create more affordability for younger people and develop a more vital economy to support all of us. Having a robust and adaptable public transportation system is going to be a huge asset in Metro Van’s ability to adapt to climate change and create a more sustainable future. Categorized under: active transportation, climate change, public health, Transportation. Tagged with: #voteyestransit, public health, transit referendum, Vancouver.